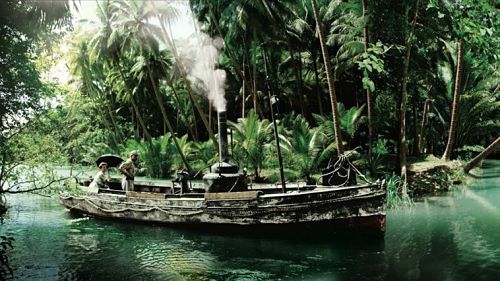 In German East Africa in 1914, Charlie Allnut (Humphrey Bogart) is a Canadian steamboat captain, who plies his trade along the river in his boat the “African Queen”, occasionally delivering mail and supplies to the village of Kungdu. There he meets, and occasionally awkwardly lunches with, the Reverend Sayer (Robert Morley) and his unmarried sister, Rose (Katharine Hepburn), who run a Methodist church in the village. When war breaks out, German colonial troops come to the village, burning it to the ground and hauling off the native inhabitants as labour. When Allnut returns to the mission post, he finds it deserted, save for Rose and the body of her brother, who died as a result of the German action. Allnut agrees to take Rose down the river to safety, but once on board the boat, she thinks she has a better idea. The death of her brother has filled her head with thoughts of revenge, and she develops a crazy scheme to use Allnut's boat to assault and destroy a German ship, the “Louisa” at the mouth of Lake Tanginyka. Allnut will need to create makeshift torpedoes using oxygen tanks and explosives, and to get to the German ship, the two of them will have to make a perilous journey along the treacherous river rapids to the calmer waters of the lake. As the two embark on their dangerous mission, a bond gradually forms over the social divide between the boozy, scruffy Allnut, and the prim and proper Rose. Rose is stern and disapproving and Allnut cheerful, hoping to make the best of a bad situation. But over time the initially starchy Rose gradually warms to the slovenly Allnut and Allnut finds himself drawn further and further into her scheme. The African Queen is a curious adventure story mixed with an odd couple romance. Despite the subject matter, it's a mostly light-hearted story, with much humour drawn from Alnutt's attempts to keep dry or to stop his stomach rumbling during a polite dinner, and from Roses's efforts to preserve her modesty when bathing in the river. It's a genial and mostly entertaining movie, but it's also superficial and the narrative is decidedly unlikely, as is the romance that develops between the two main characters. The film presents their scheme to attack a German ship not as foolhardy and probably fatal, but as a jolly adventure. For a religious woman, Rose doesn't seem to see any problem in killing lots of Germans she's never met, and Allnut is remarkably sanguine about her getting his boat destroyed and the two of them probably killed in her hare-brained scheme. The story should be a heady mix of themes, of war, revenge, heroism, colonialism, class differences, sexual awakening and late life romance. But it has almost nothing to say about any of these things and none of those themes are developed. There's little exploration of anything in the story other than the relationship between the two characters, and the film prefers to rely instead on the simple star appeal of its two leads. Fortunately, Bogart and Hepburn are definitely up to the job and can carry the film pretty much by themselves. Of the two Hollywood icons, it's Bogart who comes out best as the dishevelled Charlie Allnut, a role that would win him his first and only Academy Award. Allnut is just about the more rounded of the two characters, but the two stars bounce off each other nicely and it's their interplay that provides much of the film's appeal. Both actors are co-opting their own established screen personas to inhabit the roles, Bogart as the world-weary man's man and Hepburn as the grande dame and force of nature. The romance between their two characters is not very believably developed and they make for an implausible couple. But arguably that's the whole point, because it's the unlikely star teaming that gives the film its entertainment value. It doesn't matter if we don't believe in the romance, because we know that they're not really Allnut and Rose, they're Bogie and Hepburn. The African Queen is based on the 1935 novel of the same name by C.S. Forester, and scripted by the critic James Agee and the film's director, John Huston, with uncredited contributions from Peter Viertel. The novel had been kicked around Hollywood over the previous decade or so, mooted as a project for Charles Laughton and his wife Elsa Lanchester, and then for Bette Davis and David Niven, but some felt that the story was already too old-fashioned. Huston, though, was a fan of the book and had the project in mind for Katharine Hepburn from the start. Some sources say that John Mills was seriously considered for the part of Allnut, who is a Cockney in the novel, but Huston eventually settled on Bogart and the character was changed to a Canadian. James Agee suffered a heart attack during the writing and Huston left for the location shoot with the script still unfinished. Agee was never well enough to join the crew in England or Africa, so another writer, Peter Viertel, was brought in to help Huston finish it. The novel had two different endings, one for the UK market and one for the US, and Forester had never been entirely satisfied with either. Huston was not quite sure which to use and the ending of the film version is noticeably rushed. The film had a famously arduous location shoot, mostly in often remote and inhospitable locations in the Congo and Uganda. Hepburn became sick with dysentery, reportedly because she drank water, while Bogart and Huston stuck to alcohol. Most of the rest of the cast and crew suffered from dysentery, malaria, and various illnesses from drinking contaminated water. 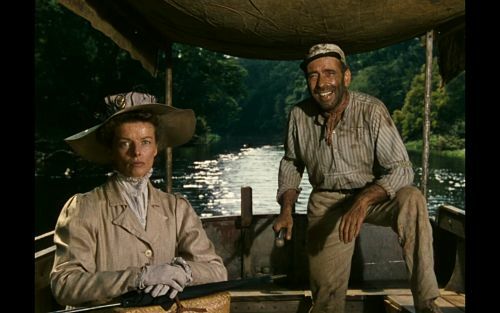 Despite the privations, Hepburn and Huston were in their element in Africa, but Bogart was a man with little interest in travel and was miserable in the heat and humidity of the Congo. Unfortunately, the African shoot also gave Huston the opportunity to blast the local wildlife and he was allegedly intent on trying to shoot an elephant on the location. The story of the location filming is told in Hepburn's 1987 book The Making of 'The African Queen', or How I Went to Africa with Bogie, Bacall and Huston and Almost Lost My Mind. Peter Viertel also wrote a novel, White Hunter, Black Heart, loosely based on his experiences making the film. Viertel's book was itself turned into a film by Clint Eastwood in 1990, with Eastwood playing the film director “John Wilson”, who is more interested in trying to shoot an elephant than in shooting a film. In addition to the location filming, studio work was carried out at the relatively obscure Isleworth Studios in London. 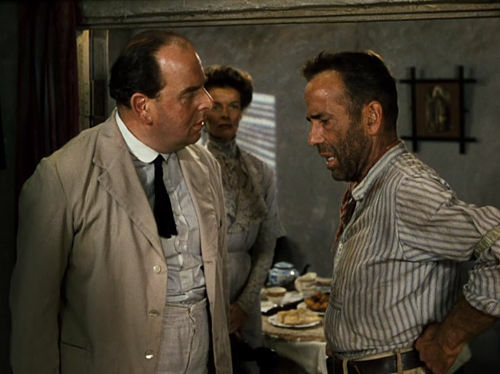 This included all of Robert Morley's scenes, and all of the scenes where Bogart or Hepburn are in the water, as it was considered too dangerous for them to film those scenes on location. There's a persistent urban legend that London's population of ring necked parakeets are escapees from the film set, but that's almost certainly untrue. The film's technical aspects are not always up to par. The miniatures of the boat going over the rapids and the back projection work are a little obvious. It does, however, have very good footage of the African locations, filmed by Jack Cardiff, probably the greatest Technicolor cinematographer in the world at the time, with second unit work by Ted Scaife. The colour location footage was part of the film's contemporary appeal, although that doesn't really hold up for a modern audience who are used to seeing more spectacular nature scenes in the average BBC wildlife documentary. The film was produced by Sam Spiegel's Horizon Pictures and the London-based company Romulus Films, run by the brothers John and James Woolf. Romulus were interested in attracting Hollywood stars to appear in British films, and The African Queen is a notable example of a major independent production at a time when the studio system was starting to break down. Huston would also make his next two films for Romulus, Moulin Rouge (1952) and Beat the Devil (1953). Huston obviously liked the story of The African Queen, because his 1957 film, Heaven Knows, Mr Allison has some similarities, as a US Marine (Robert Mitchum) and a nun (Deborah Kerr) try to outwit the Japanese on a Pacific island in WWII. 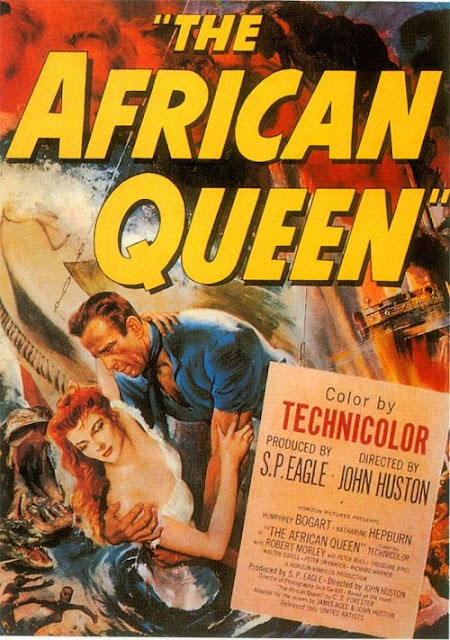 The African Queen was a big hit and a critical success, and was nominated for four Academy Awards including Best Actor (Bogart), Best Actress (Hepburn), Best Director and Best Screenplay, with Bogart winning Best Actor. It has also gained a reputation over the years as one of the Great Films, and has been a regular on best ever film lists. As a result, it arrives with a reputation as one of the all time greats, a reputation that I don't think it can quite live up to. The film is ultimately a little too single-minded, with little interest in its own subject matter beyond the opportunities it provides its stars to do their thing. Even the quite dark revenge theme is treated as no more than an excuse for a high-spirited jaunt down the river. But that probably also helps to explain the film's enduring popularity. It takes the notion of a star vehicle quite literally, heaving Bogie and Hepburn on board and then chugging along to its destination with all the stoicism of its titular boat. 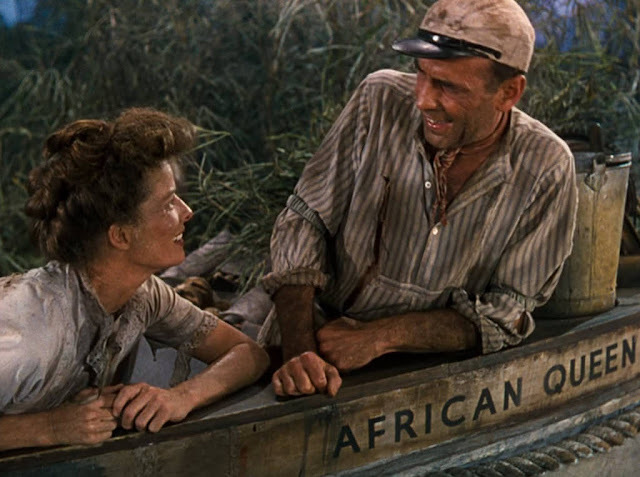 As a result, The African Queen is a genial and entertaining movie, with two Hollywood icons bickering and bantering their way down river for 100 minutes or so. It's all very agreeable and, whatever its flaws, it's a hard film to dislike.